This is the second in our series of vegan Chinese recipes. Next recipe to come is sweet and sour tofu and veg. 1. For wheat wrappers we use this excellent recipe. Make first and leave the dough to stand for 15 minutes–2 hours, as directed in the recipe. 2. Meanwhile make the pot sticker filling – recipe below. 3. Measure your dough out into 20g balls. Lightly flour a surface. Roll each piece of dough into a thin circle – called a wrapper. 4. Take one of your wrappers and lightly moisten the edge of one side of the wrapper with water. Place about a heaped teaspoon of filling into each wrapper and seal it shut, forcing any air out, to make your pot sticker. Crimp the edges. Repeat with the remaining wrappers. There are some photos of crimped wrappers here. 5. 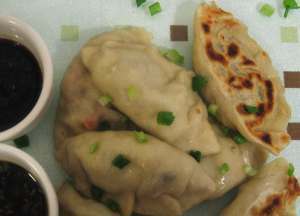 Once all your pot stickers are ready, heat a tablespoon of oil in a frying pan and then fill the pan with pot stickers. Cook over a medium-high heat for a couple of minutes until the bottoms are golden brown. Add in 4 floz (110 ml) water and cover with a tight-fitting lid. Let the pot stickers steam for 4-5 minutes. Repeat in batches until you have cooked all the pot stickers. Serve immediately. 1. Put the tvp mince in a sieve and run water through the sieve to moisten the mince. Leave the sieve over a small bowl to drain until you are ready to use the mince. 2. Heat vegetable oil in a frying pan and stir and fry onion over a low-medium heat until it starts to go translucent. Add garlic and cabbage and stir and fry for 5 minutes. Add the shiitake mushrooms and carrot and stir and fry for another 5 minutes. Take off the heat and stir in tvp mince, spring onion and salt. Taste for seasoning and add more salt if required. 3. Leave to cool a bit and then fill wrappers. Make these wrappers after you have made the filling – recipe above. Makes 12-18 dumplings (depending on size). 1. Place gluten-free (gf) flour mix, tapioca flour, xanthan gum and salt into a bowl. Add in oil and freshly-boiled water. Mix with a spoon for a minute or so to bring it together into a dough, then knead for two minutes until the dough starts to look smooth. 2. Divide the dough in half and put one half in a plastic bag, or wrap in cling film, to keep it moist. Weigh the remaining dough into 1 oz (25g) size pieces. 3. Use the gf flour mix to lightly flour a surface. Roll each piece of dough into a thin circle (called a wrapper). If you find the dough sticks too much, roll between 2 pieces of cling film. Put the wrappers under cling film and repeat with the other half of the dough. 4. Take one wrapper and lightly moisten the edge with water. Place about a heaped teaspoon of filling into each wrapper and seal it shut, forcing any air out, to make your pot sticker. Crimp the edges. Repeat with the remaining wrappers. 5. Once all your pot stickers are ready, heat a tablespoon of oil in a frying pan and then fill the pan with pot stickers. Cook over a medium-high heat for a couple of minutes until the bottoms are golden brown. Add in 4 floz (110 ml) water and cover with a tight-fitting lid. Let the pot stickers steam for 5-6 minutes. Repeat in batches until you have cooked all the pot stickers. Serve immediately.